With features ranging from lieback cracks and steep faces to off-widths and chimneys, Selaginella requires a full arsenal of climbing techniques. 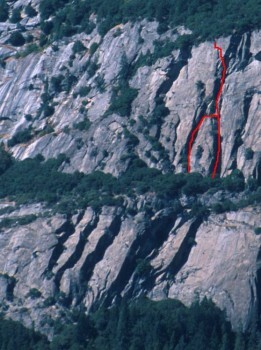 Prepare for committing and sustained 5.7 and 5.8 cracks all the way to the route's great final crux. Because of the sustained wide cracks and tricky route finding, this route is recommended for the more experienced 5.8-5.9 leader. This route allows you to escape the crowds. Which SuperTopo guidebooks include a topo for Selaginella? FA: Wally Reed and Jim Posten, 9/63. Selaginella with the variation start on the left. Munginella is the left most of the Five Open Books. Commitment takes the cleanest cracks of the Five Open Books.